Someone recently asked me how many books on the Blessed Virgin Mary I have in my personal library at home and after thinking about it for a second, I said, a lot. With all kidding aside, at that very moment, I couldn’t tell them, but did go home and count them. As of today, and the Marian section is still being developed since there are some books I don’t have yet, I have thirty-five books on the Blessed Virgin Mary. Although I have written on books before here, here, and here, it came to me as I was counting my Marian books that I have never shared with you the thirty-five books on the Blessed Virgin Mary. These books are not in any specific order nor are they ranked on importance. At the end of this list, I will share with you a few books that I don’t have yet, but plan on purchasing soon. 1. Maria: Pope Benedict XVI on the Mother of God, Ignatius Press. 2. Mary Co-redemptrix: Doctrinal Issues Today – Marian Authors, Queenship Publishing Company. 3. Contemporary Insights on a Fifth Marian Dogma – Mark Miravalle, S.T.D. [Editor], Queenship Publishing Company. 4. The Messages of The Lady of All Nations – Joseph Kunzli [Editor], Queenship Publishing Company. 5. Heart of the Message of Medjugorje – Mark Miravalle, S.T.D., Franciscan University Press. 6. Our Lady of Fatima – William Thomas Walsh, Image Books – Doubleday. 9. Our Lady of Guadalupe: Mother of the Civilization of Love – Carl Anderson & Msgr. Eduardo Chavez., Doubleday. 10. The Wonder of Guadalupe – Francis Johnston, Tan Books and Publishers. 11. “With Jesus”: The Story of Mary Co-Redemptrix – Mark Miravalle, Queenship Publishing. 12. Immaculate Conception and the Holy Spirit: The Marian Teachings of St. Maximilian Kolbe – Fr. H.M. Manteau – Bonamy, O.P., Marytown Press. 13. Preparation for Total Consecration according to Saint Louis Marie de Montfort, Montfort Publications. 14. Mary: Coredemptrix, Mediatrix, Advocate – Mark Miravalle, Queenship Publishing. 15. On the Immaculate Conception – Dom Prosper Gueranger, St. Michael’s Abbey Press. 16. Mother of Christ, Mother of the Church: Documents on the Blessed Virgin Mary – M. Jean Frisk, S.T.L., Pauline Books and Media. 18. Mariology: A Guide for Priests, Deacons, Seminarians, and Consecrated Persons – Mark Miravalle [Editor], Queenship Publishing. 19. The Wondrous Childhood of the Most Holy Mother of God – St. John Eudes, Preserving Christian Publications, Inc.
20. 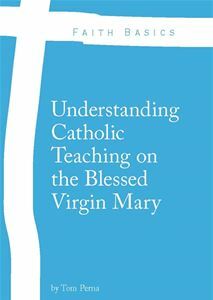 Introduction to Mary: The Heart of Marian Doctrine and Devotion – Mark Miravalle, Queenship Publishing. 22. Our Lady and the Church – Hugo Rahner, S.J., Zaccheus Press. 23. Mary of Nazareth – Federico Suarez, Scepter. 24. Discovering Mary: Answers to Questions about the Mother of God – David Mills, Servant Books. 28. John Paul II’s Book of Mary – Margaret R. Bunson (compiled), Our Sunday Visitor Publishing. 29. Mary: The Church at the Source – Hans Urs Von Balthasar & Joseph Cardinal Ratzinger (Pope Benedict XVI), Ignatius Press. 31. Hail, Holy Queen: The Mother of God in the Word of God – Scott Hahn, Doubleday. 33. The Secret of the Rosary, St. Louis de Montfort, Montfort Publications. 34. Mary for Today, Hans Urs Von Balthasar, Ignatius Press. 35. Seven Words of Jesus and Mary: Lessons from Cana and Calvary, Fulton J. Sheen, Ligouri/Triumph. If you have a book on the Blessed Virgin Mary that isn’t listed here, I would encourage you to write it below in the comment box. Please feel free, as always, to share this post on your social media outlets and with your family and friends. Thanks Tom, I will see about sharing later today. Yes, Donna. I have it, but it’s at work. Behold Your Mother by Tim Staples is on my bookshelf waiting to be read. Handmaid of the Lord by Adrienne Von Speyer, it is amazing.